In this article I will respond to questions received during the Sgt.-at-Arms Class conducted at the 2017 Department Fall Conference. At all classes I inform those present that I present “guidelines” while also cautioning that every guideline does not necessarily work the same at every Post. A “guideline” is defined as a rule, principle, or piece of advice. The physical difference in the size and configuration of all post meeting halls is the best example why guidelines are used so that necessary adjustments can be made based on local conditions to set up a meeting. 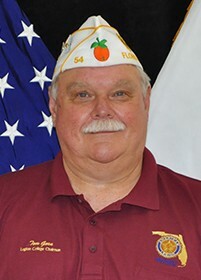 The American Legion, and the Department of Florida recognize that each Post is unique, and leaders have different management styles. To accommodate these differences leaders are given some latitude provided they adhere to National, Department, and Post Constitution and By-Laws. As a Department Officer I do appreciate when members pose questions about why we do the things the way we do, this helps us review and research to ensure our documents, lesson plans, and procedures are current and accurate. Questions asked at class means our members are attentive, and always looking for ways to make sure we’re doing things the right way. Before we go through the questions, please be reminded what Department By-Laws say about meetings and ceremonies. I often hear this is the way we did it in the Army, Navy, Marine Corps, Air Force, Coast Guard, etc. WELL, NOW YOU ARE IN THE AMERICAN LEGION, we have our own Officers Manual and Ceremonies Guide, our own protocols. The Department of Florida Sgt.-at-Arms manual is based on research, national requirements such as Resolution 288, the U.S. Flag Code, and what practices are observed at the posts, and districts, here in Florida. Question 1. Which way does the POW/MIA empty chair face when being draped with the POW/MIA flag, or chair back cover, at meetings? Resolution 288 requires “designating a POW/MIA empty chair at all official meetings.” The resolution does not address the direction which the empty chair should face. The 2017 “Post Officers Guide and Manual of Ceremonies” states the crest of the POW/MIA faces the audience when placed on the empty chair. I have watched this ceremony performed at the National Convention several times, and the empty chair is placed as if a person sitting in the chair would face the audience. In majority of post and district meetings I have attended the past few years the chair faces the audience. I recommend the chair face the assembly or audience at all Posts in the Department of Florida whether a POW/MIA flag or the chair back POW/MIA drape is used. Question 2 – When displaying a POW/MIA flag on a pole inside the post, where should it be placed, immediately to the right of the American Flag, or in line with the organizational flags? The diagram on page 3 of the Sgt.-at-Arms handbook has it next to the American Flag. The Legionnaire who posed this question also provided the regulations concerning the POW/MIA Flag passed by Congress and addresses display of the POW/MIA flag over federal buildings on six national observance days. Departments and agencies of government as well as other non-profits have their own unique way of doing things or “protocols”. The practice of flying the POW/MIA flag on the same pole outside is followed by posts that I have visited; i.e., the POW/MIA flag smaller in size, is below the American Flag. Okay, Sarge, we get that, but what about the POW/MIA flag on a pole, inside the post at times other than meetings? Where does it go? Inside the American Flag, or in line with our organizational flags? The American Legion organizational flags take precedence in display over other non-American Legion flags and banners, such as the POW/MIA flag in the same flag line. Don’t get upset, I am not saying the message of the POW/MIA flag is not important, only saying that it does not take a position of precedence over American Legion organizations flags at our ceremonies. The American Flag of course has the highest priority when on display with other flags. A correction will be made to the illustration on Page 3 of the Sgt. at Arms Manual. And remember, The American Legion Resolution 288, requires a POW/MIA flag to be placed on an empty chair at all meetings of The American Legion. Great question, I hope the answer does not disappoint. Question 3 – A bible at meetings, open or closed, can we drink or not? THIS IS A MYTH. The American Legion Post Operations Guide states no beverages are to be consumed at any official meeting. A bible, open or closed, has nothing to do with determining whether alcohol can be consumed at any meeting of The American Legion, or its’ subsidiary organizations. The National Officer’s and Ceremonies Guide, the Department of Florida Sgt.-at-Arms Handbook, and the Chaplain’s Handbook do not require a bible as part of a meeting’s opening or ending ceremony. I believe the only mention of a bible is for presentation of a bible to a deceased veteran’s family. (For the record, I have no personal objection to a bible being present at a meeting, many Chaplains carry one, it is just not required, and has nothing to do with determining whether you can drink at a meeting). Question 4 – When do we address the flag when leaving or entering a room during an official meeting or ceremony? Addressing the flag (salute) is required when leaving or re-entering a session in which the American flag is addressed during the opening and closing ceremony, such as a Legion meeting. National guidelines call for the Legionnaire to go to the center of the room to address the flag when leaving or re-entering the room. Again, common sense must prevail here. Some address the flag at their chair, some do this at the door, or you can go to the center of the room, all are correct, common sense prevails as long as you respect the flag. In closing, I will share some advice I received from a Past 5TH District Commander when I first became a Post Commander some 10 years ago. That District Commander, Bob Brewster, advised me; “Past Post commanders and many others will tell you their way of doing things. I recommend you first read the Officers Guide and other manuals and then determine whether the advice you have been given is correct.” Ten years later, that is still good advice and I pass that same advice to you.